Appenzeller cheese comes to us from the mountain district of Appenzell in northeast Switzerland. Historically, each valley of the Alps produced its own specialty cheese that was used to fulfill tax obligations. Appenzeller is actually documented in tax records that go back over 700 years! The cheese was given its AOC identity designation—similar to a patent, but in the cheese industry— in 1981 and is thus protected by a special authority in Switzerland. It's a distinction that takes decades to earn and it attests to the uniqueness, high quality and authenticity of a cheese. Not surprisingly, Appenzeller is favored the world over, but that doesn't mean it's always easy to come by. Three main varieties of Appenzeller are produced: “Classic” (silver label), aged 3-4 months; “Surchoix” (gold label), aged 4-6 months; and the limited-production “Extra” (black label), aged 6 months or longer. One of the key characteristics of Appenzeller is the brine curing process every cheese wheel undergoes. Each cheese is treated with a mixture of wine, spices and herbal brine, the recipe for which remains a well-kept secret known only to a few. The brining lends a spicy character that grows stronger the longer the cheese ages. This month we bring you Appenzeller Extra, a relatively rare (making up just 2.4% of all Appenzeller production), full-fat, semi-hard cow's milk cheese that is selected and matured with the highest of standards, and sent to market at the height of its maturity. After exacting analysis, cheese-making experts carefully select the best of the Appenzeller cheeses—those that fulfill a rigid set of standards—to mature for long periods and become Appenzeller Extras. The same experts who select the products to be aged to full maturity also oversee the aging process: six months in climate-controlled cheese cellars maintained at exactly 15 degrees Celsius. We are very pleased to be able to bring you this rare cheese, sought out by connoisseurs around the globe for its unique, full-impact taste. Aged for over 6 months, this cheese is on the slightly spicy side, with a pronounced aroma from the extensive brine aging. It's a pressed, cooked-curd cheese with occasional pea-size holes. We found it to have a pleasing, smooth texture. 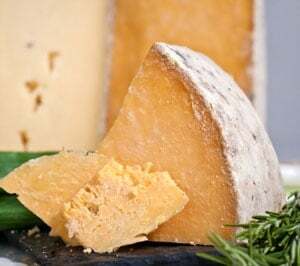 Its real charm though, is its fruity tanginess, imparted by the wine or cider wash it receives during curing, making it a perfect complement to delicious summer fruits or to be served as a dessert cheese. 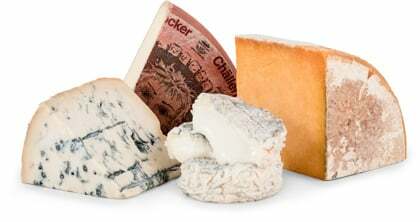 Milder Appenzeller varieties, on the other hand, are excellent for snacks, sandwiches, grilling, or as a melting cheese. Of course, the use of wine in the curing process also makes this cheese particularly well-suited to wine pairing.